Like many languages across the globe, the Celtic languages today are experiencing varying degrees of minoritisation and revitalisation. The experience of the Celtic languages in the twenty-first century is characterised by language shift to English and French, but they have also been the focus of official and grassroots initiatives aimed at reinvigorating the minoritised languages. This modern reality is evident in the profile of contemporary users of the Celtic languages, in the type of variation that they practise, and in their views on Celtic language and society in the twenty-first century. In turn, this reality provides a challenge to preconceived ideas about what the Celtic languages are like and how they should be regarded and managed at local and global levels. This book aims to shed light on some of the main issues facing the Celtic languages into the future and to showcase different approaches to studying such contexts. 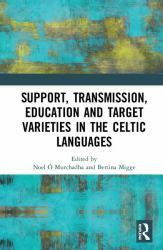 It presents contributions interested in explicating the modern condition of the Celtic languages. It engages with attitudinal support for the Celtic languages, modes of language transmission, choosing educational models in minority settings, pedagogical approaches for language learners and perceptions of linguistic practices. These issues are considered within the context of language shift and revitalisation in the Celtic languages. The chapters in this book were originally published as a special issue of Language, Culture and Curriculum.